It’s World Cup time. Thirty-two nations are being represented in South Africa as they compete in “the beautiful game” for a chance to hold aloft soccer’s World Cup trophy. Of course, the four years of bragging rights are a sought-after bonus, as well. Soccer has deep traditions around the world. Many fanatics ‘religiously’ follow their favourite soccer, or perhaps more properly, football clubs. Last night, my son, John and I took in a match featuring the fabled Scottish side Glasgow Celtic. Although raised in the Canadian tradition of hockey, John has developed a soccer expertise, complete with favourite teams in various leagues. So how did a young man, raised in the hockey mad culture of Canada, develop a passion for soccer? Could this be an inherited trait? I don’t think my inheritance theory can truly be substantiated but I can, with some certainty, state that my son didn’t develop his passion for soccer as a result of any influence from me or, for that matter, his paternal grandfather. Could there have been some influence of this trait from his paternal great-grandfather? I knew that his great-grandfather (my grandfather) John Gaull Hadden played soccer. I had his worn, but bronzed soccer shoes, complete with tacked-on strips of leather that replaced long lost cleats. But to what extent was he really involved in the game? It’s easy to imagine that as a boy growing up in Aberdeen, he learned to love and play the game but could he continue to play in Canada? The shoes suggested he did but I needed further evidence. Two items have confirmed his continued involvement in the game. 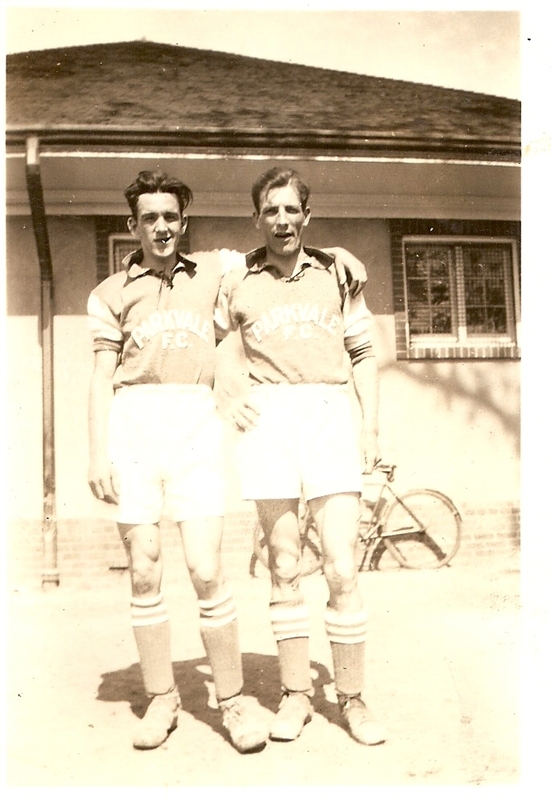 First, in the photo to the right , John Gaull Hadden is seen on the right with an unidentified teammate while playing for Parkvale F. C. (Football Club). The photo was taken in June 1935 when John was 25 years old. The second “proof” was found in a Toronto Star newspaper article! On July 30, 1942 the newspaper reported the outcome of a game between the ‘Toronto Shipbuilders’ and ‘Lancastershire’ clubs played on a rain soaked field at Toronto’s Riverdale Park. With the ‘Shipbuilders’ up by by a score of 3 – 1 midway through the second half of the game, “Lancs got back into the game when John Hadden rifled home a penalty kick, but that was as close as they got.” Unlike some of today’s sold-out stadium matches, only 20 spectators were on hand to witness John Hadden’s goal. I’ve heard some claims that family traits could be observed through up to five generations. Could a love for the ‘beautiful game’ be such a trait in the Hadden lineage?